I usually respond by telling the student that he (or she) will never be a great player as long as one believes those things. 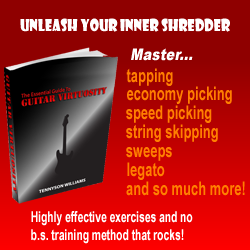 Great players like Yngwie and Vai didn’t just pick up the guitar one day, practice for a little while and then become virtuosos. Both of them had worked extremely hard developing their awesome skills. Yngwie has been quoted (many times) as saying that he practiced 8 hours a day between the ages of 13 and 18! If he (and others) were born with all of this talent then why did they all have to work so hard to get where they are today? A great non-musical example of perseverance would be the great basketball star, Michael Jordan. Jordan wasn’t even good enough to make it on his local high school basketball team! Most people would have given up after such a disappointment and most would have believed that there would be no point in trying again next year, since they obviously would assume that they don’t possess the talent. We all know that this was not how Jordan thought about his situation. He worked extremely hard everyday, practicing and asking the coach to teach him, even though he was not a member of the team. The next year, Michael made the team and went on to eventually become one of the world’s greatest athletes of all-time. I’ve known a few students to believe that they did have natural musical ability. Unfortunately, I have watched them waste their time waiting for their ‘natural ability’ to turn them into great musicians. They showed some initial progress when they practiced, but depended too much on their talent to do the rest of the work for them. Usually at this point, they begin to become lazy and practice less, thinking that they will be great anyway. It is always hard for a teacher to see students fail because they didn’t persevere when the potential was there. What does all of this mean for you? It means that you can achieve great things if you have the passion in your heart for music and if you have the perseverance to learn and practice each day. It will take a long time, but it is well worth it. Each of you has basically the same potential as everyone else to accomplish great things. Don’t wait for some natural abilities to take you where you want to be though. You must believe that you can do it only if you work hard and long. If you believe in this concept and believe in yourself… dreams can come true.